I’m a confirmed omnivore and think I always will be. I love my vegetables and am happy to eat plenty of meatless meals, but I also love meat. As meat eaters, I think it’s very important to know where our meat comes from, starting with the simple fact that meat comes from animals. (Apparently there is a growing number of people who either aren’t aware that meat comes from animals or simply choose to ignore this fact because the thought is unpleasant to them.) Growing up in the country surrounded by animals I have always been aware of which meat comes from which animal. My father was a hunter of small game – rabbits, pheasants and such like – so we regularly had freshly killed animals hanging in the shed. My sister was a little squeamish, but I was happy to watch as they were skinned or plucked and prepped for cooking. It is a rite I think all children should witness to truly understand the provenance of their food. Last weekend we undertook our maiden voyage in our camper van, travelling primarily in west Waterford and Cork. 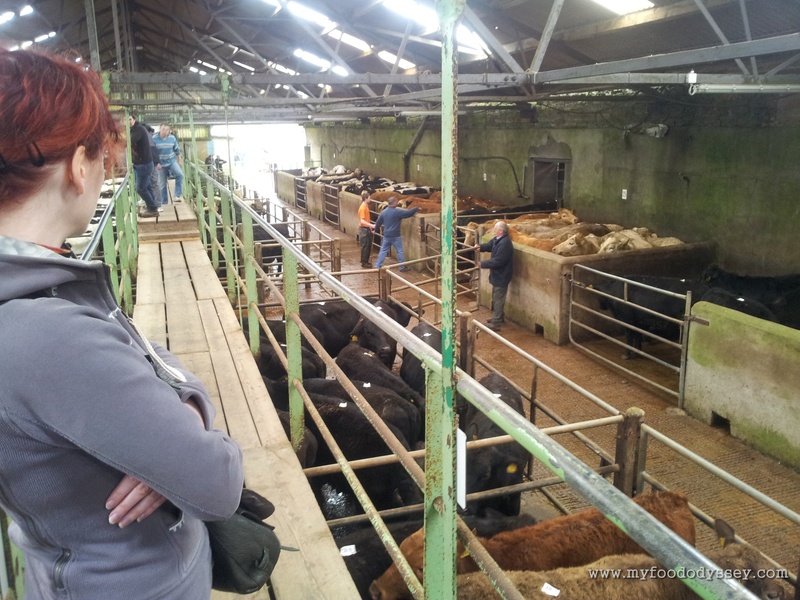 On our way home we passed through Bandon, where I noticed scores of four-wheel drives pulling trailers parked carelessly along the roadside, and thus my eye was drawn to a large cattle mart. Based on the number of trailers I gathered there was a mart in progress. I’d always wanted to see a mart in action, so we stopped to take a look. I was a little apprehensive at first, feeling I was intruding on the private affairs of farmers and butchers. However, thanks to two days in the van I was sufficiently disheveled to blend in nicely, despite being one of only two women present. I was immediately fascinated with the whole affair, from the catwalks across the pens to the herds of beautiful cattle to the auction itself. I stood at the back of the auction pen to observe proceedings. I had read recently in Pat Whelan’s book how savvy the bidders can be, attempting to distract and outwit other buyers at every turn, and was determined to get a glimpse of this mischievousness in action. After a few minutes of careful study I could finally detect when a buyer was making a bid. The movements were barely perceptible. Unfortunately I was too far from the front and the pen was too packed for me to notice any distraction techniques. Lot after lot of cattle were moved in an out of the central pen, yet I did not find it repetitive or dull. I was too busy trying to discern how one lot differed from another and what made certain lots more desirable than another, therefore leading them to command a higher price. I really would have needed an experienced guide to talk me through the nuances, but I was having fun trying to figure it out for myself. I was also trying to calculate the cost being paid per kilo, how much saleable meat a butcher might get off a 500kg animal and what price might be charged for this beef in a retail store. I was in my element and eventually had to be dragged out by a bored and bewildered husband. About a mile from home we spotted an enormous bull standing majestically in a field, staring out onto the road. He was the most muscular and magnificent bull I have ever seen. We pulled over to take a picture. My husband was first out of the van as I fumbled for my camera. Suddenly we heard a shout and I looked up to see the farmer running down the field, waving wildly at us. “Don’t come in”, he cried. He was afraid that we were going to climb over the gate for a closer look. Not bloody likely. Having had a recurring dream of being chased by a bull since childhood, wild horses would not get me into that field. 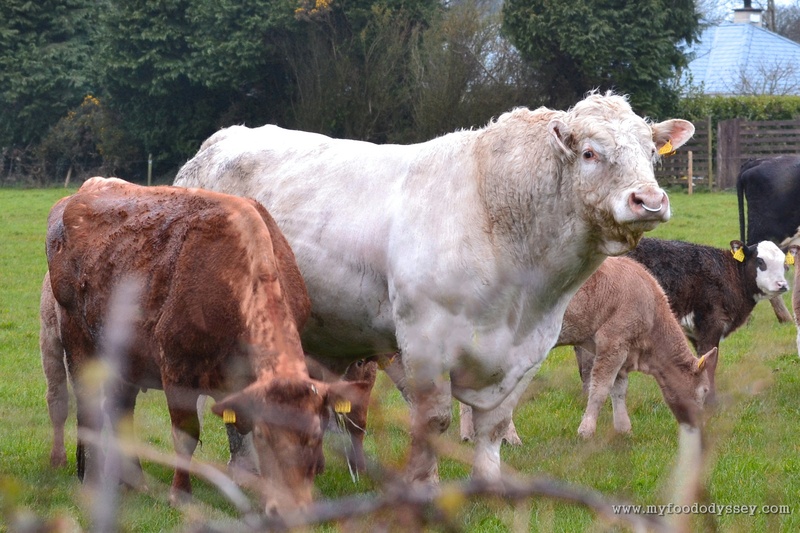 The farmer told us that he was a Charolais bull, about one ton in weight. He was employed to cover about 100 cows each year – not bad work if you can get it! The cows were a mix of breeds and generally had one calf each per year. Twins were rare – about 2-3 sets across the whole herd each year. 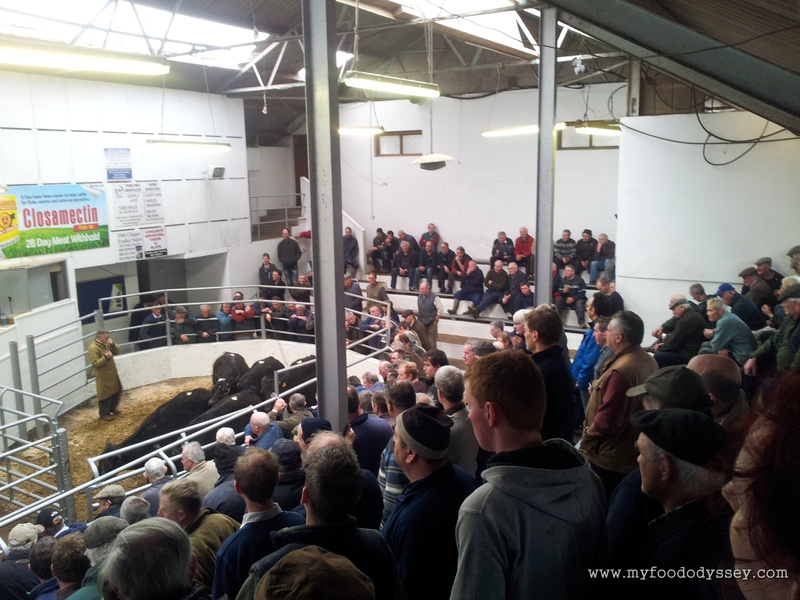 The cows then reared their own calves, which would be milk and grass fed before being sold on at the local mart. After a cow-filled day it would have been apt to have beef for dinner. As it happened, I had picked up a rack of lamb at an absolute bargain price. (May I recommend Tesco’s at 7pm on a Sunday for marked-down meat!) We eventually fell into bed, exhausted from the trip, and I hoped that thoughts of that magnificent bull would not incite the revival of my recurring dream. How did I miss this the first time? I went to the mart to research for my book back in October. We rarely sell at the mart and have a closed herd so never visit to buy any stock as rear our own replacements. Enjoyed reading your perspective on it all – it is quite fascinating isn’t it and an interesting atmosphere too. I loved it, Lorna. I had to be dragged out in the end! I would love to go with someone who was either buying or selling to get a better insight into the workings. Given the ratio of men to women I can definitely recommend it as a potential place to pick up a farmer! Most of them seemed quite distracted by the goings-on, but you never know your luck! I was not squeamish! Well, maybe just a little bit…….. Thanks Paddy. Hope your son survived the rite of passage and enjoyed the resultant meal! Great post June. I completely agree with your sentiment that people should be more aware sourcing their meat. My little son had something of a baptism of fire in this regard, when I gutted and skinned a freshly shot rabbit in front of him!